We've all heard the tag "A Pet is for Life", which means not buying a cute puppy or kitten on a whim. With pet ownership comes responsibility and the needs of the pet have to be met. Some people forget that a dog or cat can live a long time, and they really become part of the family. Pet ownership has become hugely popular in Singapore and if you own an animal it's best to be well informed about how best to look after your furry friend (or not so furry in some cases). If you want to learn more about your pet, or if you are thinking about getting one but need some advice, the Responsible Pet Ownership Roadshow, hosted by Agri-Food and Veterinary Authority (AVA) is a great opportunity. You will be able to get a free basic pet examination by a vet, listen to some talks and workshops about responsible pet ownership and pet health care and enjoy the Healthy Coat (Saturday) and Bright Smile Competitions (Sunday) for dogs, cats, hamsters, rabbits and Guinea pigs. Best of all, you will be able to show off your own gorgeous pet. All those cats, dogs rabbits and who knows what else under one roof will surely make for an exciting couple of days. 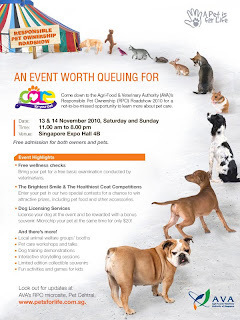 For more information go to PetsforLife.com.sg Download the pdf for a full schedule of events on both days.